Very large with long legs and heavy bill. Resembles Purple Heron in plumage but is twice the size. Distinctive features of adult are rich chestnut head and hindneck, bluish grey upperparts and rich chestnut underparts and underwing coverts. 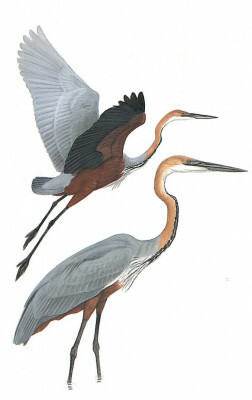 Told from Purple Heron by large size, stouter head and neck, lack of any black on crown, absence of black line across cheeks and greyish bill. In flight, wing beats slow and heavy with legs protruding more beyond tail than in Grey or Purple Herons.